HUGHESVILLE, Pa. — At first, Raymond Gregoire did not want to listen to the raspy voice on his answering machine offering him money for rights to drill on his land. They want to ruin my land, he thought. But he called back anyway a week later to hear more. “It’s a modern-day gold rush in our own backyard,” Mr. Gregoire said. Not just his backyard either — a frenzy unlike any seen in decades is unfolding here in rural Pennsylvania, and it eventually could encompass a huge chunk of the East, stretching from upstate New York to eastern Ohio and as far south as West Virginia. Companies are risking big money on a bet that this area could produce billions of dollars worth of natural gas. 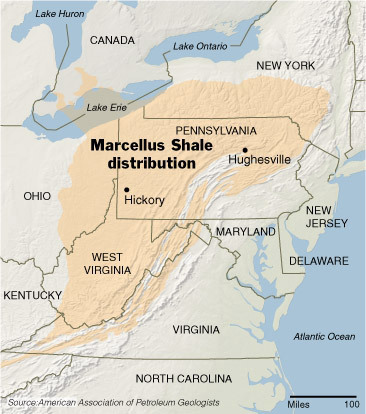 A layer of rock here called the Marcellus Shale has been known for more than a century to contain gas, but it was generally not seen as economical to extract. Now, improved recovery technology, sharply higher natural gas prices and strong drilling results in a similar shale formation in north Texas are changing the calculus. A result is that a part of the country where energy supplies were long thought to be largely tapped out is suddenly ripe for gas prospecting. Pennsylvania, where the Marcellus Shale appears to be thickest, is the heart of the action so far. Leasing agents from Texas and Oklahoma are knocking on doors, leaving voice mail messages and playing host at catered buffets to woo dairy farmers and retirees. They are rifling through stacks of dusty deeds in courthouse basements to see who has underground mineral rights to the deepest gas formations. Thomas B. Murphy, a Pennsylvania State University educator who runs a program to instruct landowners on their rights, estimated that more than 20 oil and gas companies will invest $700 million this year developing the Marcellus Shale. Up to one half of that will be invested in Pennsylvania, he estimated. Industry experts say in the last three years companies like Anadarko Petroleum, Chesapeake Energy and Cabot Oil and Gas have leased up to two million acres for drilling in the region, half of that in the last nine months. Whether their bets will pay off is by no means a sure thing. Researchers at Penn State and the State University of New York at Fredonia estimate that the Marcellus has 50 trillion cubic feet of recoverable natural gas, roughly twice the amount of natural gas consumed in the United States last year. But government estimates of the amount of gas recoverable from the Marcellus are relatively modest. Early test results have encouraged companies to keep drilling, but most are holding details of their test wells close to the vest. The company that has done the most work is Range Resources of Fort Worth, which says it plans to invest at least $426 million in the Appalachia region this year. The company has reported promising results from the first 12 wells that it has drilled horizontally, the technique considered by most experts to be the most effective in the Marcellus. The most recent six have each produced more than three million cubic feet of production a day in recent months, and company executives say that is better than the average for wells recovering natural gas in the Barnett Shale in north Texas. Energy experts say the Marcellus, along with other smaller shale formations being developed around the country, is coming under scrutiny at an opportune moment, just when conventional domestic natural gas production and imports from Canada are diminishing. With easy-to-find gas fields in decline, the country will need to explore in deeper waters in the Gulf of Mexico and penetrate deeper under the surface on land. If all goes well, the Marcellus could help moderate the steep climb in natural gas prices and reduce possible future dependence on natural gas from the Middle East, which is beginning to arrive at coastal terminals in liquefied form. Natural gas in the Marcellus and other shale formations is sometimes found as deep as 9,000 feet below the ground, a geological and engineering challenge not to be underestimated. The shales are sedimentary rock deposits formed from the mud of shallow seas several hundred million years ago. Gas can be found trapped within shale deposits, although it is too early to know exactly how much gas will be retrievable. The gas from all the shales combined “is a game changer,” said Robert W. Esser, an oil and gas expert at Cambridge Energy Research Associates. He estimated that shale produced four billion cubic feet of gas a day on average last year, or about 7 percent of national production, and that shale gas production would increase to nine billion cubic feet a day by 2012, or about 15 percent of expected national production. The New York State Energy Research and Development Authority estimates that developing New York’s portion of the Marcellus could roughly double the amount of natural gas now produced in New York. Currently that is about 55 billion cubic feet a year, providing for 5 percent of the state’s needs. The Marcellus has suddenly become attractive in large part because natural gas prices have spiked in the last several years and the geologically similar Barnett Shale has been an industry sensation. By using horizontal drilling techniques, oil and gas companies have been able to draw natural gas from underneath the city of Fort Worth, even from below schools, churches and airports. The companies have perfected hydraulic fracturing techniques, pumping water and sand into well bores to fracture shale and release gas from its pores. Production in the Barnett has exploded from a trickle five years ago to over three billion cubic feet a day, and energy experts say that number could more than double by 2015. Shale gas development in other parts of Texas, Louisiana and Arkansas has also shown promise. But no formation compares in size to the Marcellus. It is deeply entrenched in wooded and mountainous countryside and expensive to reach. But the reserve is also within short pipeline distance from some of the nation’s most energy-hungry cities. Still, not everyone here is happy about all the leasing and drilling. At meetings with the companies, landowners have asked questions about potential hazards to water and woodlands. Keith Eckel, 61, a grain farmer with 700 acres in northeastern Pennsylvania, said he had not decided whether to let the companies drill on his property. “Farmers have taken care of this land all their lives and don’t want to see it destroyed,” he said. Mr. Deiseroth has put new windows in his house, bought a new fishing boat and plans to build a new garage. His 89-year-old father and 90-year-old mother, who live nearby, just got a $20,000 monthly check. His father has replaced the golf cart he drove around his farm with a Kubota utility vehicle, while his mother has bought a flat-screen television.